Officially named as the Son Sant Joan Airport, Palma de Mallorca Airport (PMI) is a busy facility with four terminals, which are housed in a single building. With an annual passenger throughput of more than 23 million, Son Sant Joan is Spain's fourth busiest airport, facilitating air travel for domestic, EU and international passengers to the popular holiday destination of Mallorca. 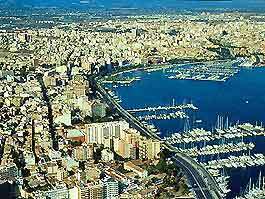 Palma de Mallorca Airport is located around 8 km / 5 miles to the east of Palma Town and next to the coastline, Can Pastilla and Sant Jordi. The main destinations connected by Son Sant Joan include Barcelona, Berlin, Dusseldorf, Frankfurt, Lisbon, Madrid and Manchester. Public buses run to central Palma from two stops at the airport, while there are a number of taxi operators offering tiered fares to locations such as Capdepera, Llumajor, Manacor, and Son Servera to the east of Mallorca Airport, and Calvià, Costa de la Calma, Peguera and the Port de Palma to the west. A number of free hotel shuttles are also available. Meanwhile, car hire companies provide an altogether more comfortable and convenient option. The Hotel Melia De Mar is a short drive from the airport and is known for its conference facilities and a business centre. Many other hotels are close by and tend to be clustered around Mallorca's main coastal resorts. One of Spain's much-loved Balearic islands, Mallorca has been a popular holiday destination with Europeans for many decades, offering fantastic sandy beaches and a solid tourist infrastructure as well as typical Spanish charm. Palma de Mallorca is the capital and full of notable sights, including the Gothic cathedral, Palau de l'Almudaina, the Arab Baths (Banyas Arabas) and Bellver Castle (Castell de Bellver). Visitors arriving at Palma de Mallorca Airport (PMI) will find that the island is both family friendly and suitable for young hedonistic types, with resorts offering relaxing beaches for daytime activities and popular Spanish shows and busy nightclubs for evening entertainment. Palma Town is perhaps most popular with revellers, while the smaller coastal resorts to the east attract holidaymakers who are looking for a quieter experience, such as the Cala Mondragó or the Cala Figuera.